This facial treatment helps clear breakouts, while keeping your skin young and beautiful looking. Suitable for adults and teenagers. Helps diminish your acne and prevent scaring. This deep pore cleansing, clarifying and anti-inflammatory treatment is the perfect facial to combat spots and breakouts. It reduces four important contributing factors: excess sebum/oil production, over production of dead skin with clogged pores, inflammation and bacterial growth. It begins with a deep pore cleansing and gentle exfoliation of the skin to remove dead cells debris, followed by thorough extractions. A detoxifying and soothing mask is applied. in order to reduce bacteria, decrease skin oiliness and tighten pores LED Blue light is applied as well as a retinoid booster. once breakouts are cleared, we treat scaring and post acne hyper-pigmentation with either microdermabrasion or chemical peels. This Treatment is designed for treatng hyperpigmentation, sun spots, age spots and melasma. customized facials, chemical peels and or microdermabrasion are used to improve skin color. keep in mind that once you start the treatments is very important to continue with them, because at first your skin gets darker before it gets lighter due to pigment being push out of the skin . patience and commitment will achieve to a great skin. EMS(Electrical muscle stimulation) a non surgical face lift method which applies small, and gentle electronic stimulation to the skin which in turn stimulates the muscles underneath, enhances circulation in the face and finally the way in which it rejuvenates complexion and skin tone. 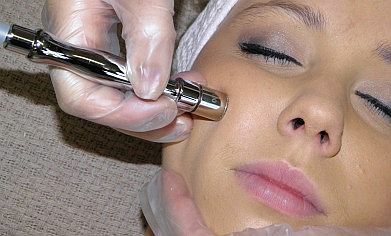 EP(Electroporation) is the latest technique by virtue of which one can easily push products into the deeper layer of the skin without injecting. This amazing treatment is suitable for any skin type and results (skin tightening, wrinkle reduction) gradually begin to appear within 2 months and are completed in 6 months. Results usually last till 2 years!!! Microdermabrasion is a non-surgical procedure designed to exfoliate or remove the outer layers of the skin. A diamond tip wand is used to exfoliate and remove dead cells from the outer most layer of the skin. This treatment will stimulate production of healthy cells, collagen and elastin. Is an intense treatment that is good for anyone looking to improve their skin appearance and reverse the aging proces, it helps to reduce fine lines, wrinkles, age spots, acne, scarring, and sun damage.